Come along on this 5.5 hour guided tour of historical sites, including the National Memorial Cemetery of the Pacific, Historic Downtown Honolulu, World War II Valor in the Pacific National Monument, and the USS Arizona Memorial. Hotel pickup and drop-off from Waikiki hotels and transportation between sites via air-conditioned mini-bus is included. Immerse yourself in the sights, sounds, and legends of December 7, 1941 as you journey with your guide through the National Memorial Cemetery of the Pacific (Punchbowl Crater) followed by historic Honolulu, and ending at ground zero of the attack that changed the world. After pickup from your hotel between 10am - 10:20am via mini-coach, the first stop on the tour is the National Memorial Cemetery of the Pacific to pay respects to the 50,000 U.S. military veterans of the Vietnam and Korean wars, and World War I and II. 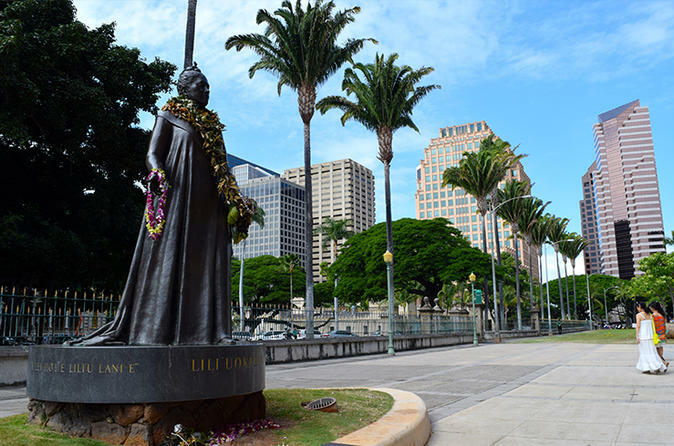 You will then head to downtown Honolulu where you’ll learn about the overthrow of the Hawaiian monarchy, revel in the architecture of restored buildings, including a beautiful royal palace, and view homes and churches built by early missionaries. The final stop is the USS Arizona Memorial and WWII Valor in the Pacific Monument. As you learn about that infamous day, December 7, 1941, you will see a short film and ride a ferry to the memorial that sits atop the sunken battleship. Be ready for spur of the moment stops, unexpected views and special sightseeing along the way. The tour ends with drop-off back to your Waikiki hotel at 3:30pm.